Rewards cards are your ticket to something for nothing - but how do you decide between flash cashback, sweet frequent flyers or a solid gold card? Head straight to the latest rewards deals below, or compare rewards cards with our nifty Rewards Revealer search tool. What are the benefits of a rewards credit card? Rewards credit cards come in various guises, from frequent flyer credit cards to travel rewards, cashback deals and giftcard programs. For more info on the benefits of rewards cards read our handy guide rewards cards versus annual fees. Can I compare rewards credit card programs? Once this would've involved a lot of unrewarding number crunching. However, Mozo has introduced the Rewards Revealer to crack the rewards card code and deliver the best deals for your personal credit spend. Rewards credit card comparisons on Mozo - rates updated daily Mozo has robust processes to ensure our site is updated to reflect the latest information from providers. There may be the odd occasion where updates are delayed, so please confirm information before purchasing. A rewards credit card can open the door to some great perks like travel, retail therapy and other premium perks. But finding the right rewards credit card is key to getting the best value - we’re here to help you compare your options. The theory behind rewards credit cards is simple enough: spend money on your card to earn points that you can redeem for things you want, like retail therapy, the big one, travel and of course plenty of other premium perks. But how do you decide which rewards card is right for you? We’re here to help. A great way to start off with a good stash of points, is to take advantage of a bonus points offer. Just be sure to check if there’s a minimum spend and that you’re comfortable managing it if so. You should know how many points you get for every dollar you spend on your card. This is called the points earn rate. It’s also important to go for a rewards program that suits you. There’s no point in accumulating frequent flyer points if you suffer aviophobia (fear of flying). The Mozo Rewards Credit Card Comparison Table is a great tool that you can use to sift through the sometimes complicated info around rewards cards and get a real apples for apples comparison. Whatever your motivation, whether it’s seeing the world or bagging a bargain on the world’s greatest toaster, a rewards card can help you get there. 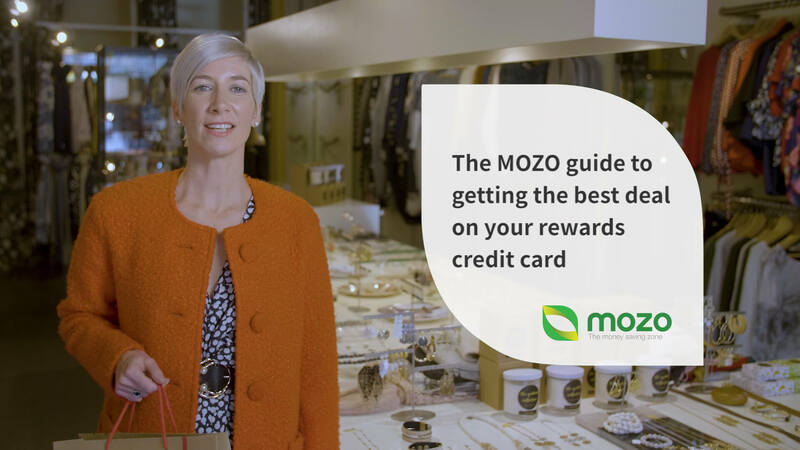 Head to Mozo.com.au to find out how you can get the best deal on your rewards credit card. If you are in the market for a new credit card you might be thinking why not get rewarded for your spending? Sounds like a good proposition doesn't it. You spend money and your bank gives you free stuff. Awesome. But before you jump in and sign up with the flashiest card in the market there's a few reward card must-knows which we'll run through in detail in this guide. If you don't have the time to read our rewards card wisdom, you can always jump straight to our Experts Choice Awards page. Each year, the Mozo money experts review all rewards credit cards in our database and award those cards that offer the best value to customers based on their spending habits. What types of credit card rewards are there? Airline frequent flyer rewards. Many banks and rewards card providers have credit cards that are directly linked to airline frequent flyer programs. This means that when you make purchases on your credit card, all points you accrue for those purchases will be turned into airline frequent flyer miles. Some airlines offering direct earn programs include Qantas, Virgin, Singapore Airlines and Emirates. General rewards. With a general rewards program, you’ll accrue rewards points which you can use to buy a range of products and services ranging from cash back, shopping and travel rewards including flights or accommodation. Popular rewards programs that fall under this category include Westpac Altitude Rewards Program, American Express Membership Rewards, NAB Flybuys, CommBank Awards, Citi Rewards and ANZ Rewards. Supermarket rewards. Woolworths and Coles have rewards credit cards that give you cash back in the form of shopping cards which you can use at the till to reduce the cost of your groceries. How do I choose a rewards program? It is a common assumption with rewards credit cards that the more money you spend, the better the rewards. This is only partly true. To get the most value from a rewards program you will need to choose a card that delivers you value for your spending habits AND offers you the greatest benefit for the rewards you are interested in. What's the point in having a card with the highest earning rate for Qantas Frequent Flyer miles when you don't travel often? But before you start reviewing cards for flight or shopping offers, the first question you need to ask yourself is: will I pay my credit card balance off in full each month? If you answered yes, great, read on. If you answered no, a rewards card may not be for you. Rewards credit cards have higher interest rates and annual fees than standard credit cards so if you have an ongoing balance, the amount of money you will pay in interest and fees will outweigh the value you will get from any rewards. See here to compare low interest cards. Mozo's Rewards Revealer tool is the only calculator in the market that will give you a ranking of rewards cards based on your spending level and rewards you're interested in. A quick play with the tool will reveal just how different the rankings are for someone who spends $18,000 a year on their card and someone who spends over $60,000 annually. What other factors do I need to consider with rewards programs? Not all points are created equal. The standard points per dollar spent equation is 1 point per $1 spent but some cards will have higher or lower points earnings per dollar amounts. And to make matters even more complex 1 AMEX point might be more valuable than 3 points spent on Visa. You need to compare programs on what those points will actually buy you. Check the redemption rates before you sign up because you could find that there is a big difference between what 50,000 points will get you on Card A and what you can get with 50,000 points on Card B. To help cut out some of the confusion Mozo has a “spend required” column in the table above which helps you to compare the difference between points values. American Express cards have on average higher points earning rates than Visa or MasterCard rewards cards. Points capping. Some rewards cards will have a cap on the amount of points you can earn in a month or over a year period. If you’re a big spender look for a program that does not have any points caps. Click on the ‘more info’ link in our tables to see if a cap applies. Points expiry. If it’s going to take you a while to build up enough points for a reward, you’ll want a program with no points expiry. Bonus points. With some rewards cards you will get the opportunity to earn bonus points. You might get them as a lump sum when you sign up for the card, or when you spend a set amount on the card in a specific timeframe. Other rewards cards will give you bonus points when you spend money with specific retailers or stores. When weighing up bonus points offers, it is important to ensure you review the ongoing interest rate and any fees attached to the card, especially if there are spending limits to earn the bonus points. You don’t want to overspend and get into debt just to earn $50 cash back for instance. Your lifestyle. Do you only ever travel with Virgin Australia? Then choose a program that’s linked with the Velocity Frequent Flyer program. If you want the flexibility to choose between travel or shopping rewards then go for a general rewards program that will allow you to redeem points for more than one type of reward. Easy points redemption. Some programs will automatically send you a reward once you have reached a set number of points or in the case airline frequent flyer programs, automatically transfer points earned each month to your frequent flyer account. With other cards you may have wait for vouchers to be sent or products shipped. What type of credit card features should I look for? Now that we've got the features of the rewards card programs out of the way, it's time to look at what features you'll get with your credit card. Interest free days. If you pay your balance off in full each month you will get a set number of interest free days. On rewards cards this will range from 44 to 62 days. Worldwide access. Your card will come connected to either the MasterCard, Visa or American Express scheme and you’ll be able to use your card in Australia and overseas wherever these cards are accepted. PayPass or PayWave. All credit cards these days come chip enabled which means that you can use contactless payments in Australia for purchases under $100. Fraud protection. Rewards cards will have fraud protection where you won't be held responsible for any unauthorised charges online as long as you notify the card providers immediately upon discovery of any fraudulent transactions. Complimentary travel insurance. Many rewards cards come with inbuilt overseas travel insurance when you pay for some of your pre-travel expenses on the card. Every card has different eligibility criteria so you will need to review this carefully. Some will require you to book your flight with your card others will only require you to have spent up to a set amount. Extended warranty and purchase protection. If you lose or damage goods bought with the card in a set period you may be able to claim them on your card’s insurance. Price protection. With this insurance you will never miss out on a sale. If you purchase an item with your card and you see it cheaper within a set period you can claim back the difference. For this insurance, generally the difference in price needs to be more than $50 or more. Concierge. Many rewards cards come with a concierge service that you’ll be able to tap into for restaurant and entertainment booking or recommendations for when you’re out shopping or visiting new cities. What fees do rewards credit cards have? Annual fee. Rewards credit cards usually have higher annual fees than credit cards without rewards programs. If you will only be using your card occasionally look for a low annual fee rewards card, otherwise you could find that you will pay more in the annual fee than you receive in rewards value. Cash advance fee. Using your card for cash advances is one of the biggest credit card no-no's as you'll pay interest immediately. But you will also have to pay a fee which will be a percentage of the withdrawal amount or a flat fee depending on which is higher. Foreign transaction fee. When you use your credit card overseas or when you shop at international online stores your credit card company will charge you a fee. This fee will be a percentage of the foreign transaction amount converted into Australian dollars. It is usually around 3%. Late payment fee. If you fail to pay your credit card on the due date you could be charged a late payment fee. These can be as high as $30 so it is best to automate your payments through online banking or direct debit. Frequent Flyer Program Fee. If you opt for a credit card that is directly linked to an airline's frequent flyer program you may have to pay an annual program fee on top of the card's annual fee. Frequent Flyer Membership Fee. If you are not already a member of a frequent flyer program like the Qantas Frequent Flyer Program you may have to pay a fee to join. Look to see if the credit card comes with complimentary membership. Can I earn rewards on a balance transfer? No, you will not earn any rewards points on balances transferred but you will save on interest if the card has a low balance transfer rate. Check out our tables to compare Rewards Credit Cards and get the right deal for you!